Atascosa County reaped five consecutive months of sales tax revenue gains. 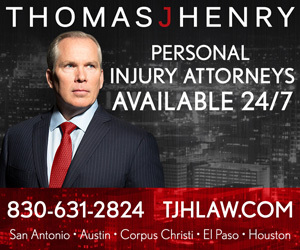 This month’s allocation check from Glen Hegar, Comptroller for the state of Texas, totaled $402,976. 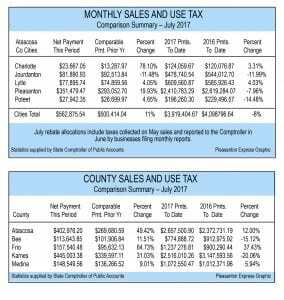 Atascosa County continues to outpace sales tax revenues it earned in 2016. Cumulative payments for 2017 stand at $2,516,010 for an annual increase of 12 percent. Out of our neighboring counties, Bee, Frio, Medina and Karnes, only Karnes County saw a larger check than Atascosa. Karnes County’s payment was $445,003. However, Atascosa County’s year to date payments yield the largest amount out of the five counties totaling $2,657,500. Pleasanton’s net payment this period was $351,942 compared to the prior years of $293,052 for a gain of nearly 20 percent. Charlotte had the largest percentile of growth with a whopping 78.10 percent. Charlotte’s rebate totaled $23,667 this month compared to last year’s payment of $13,287. The most sizable decrease was Jourdanton with a negative 11.48 percent change in its allocation. Jourdanton has a deficit of 12 percent in their payments year to date with 2017 totaling $478,740 as compared to 2016 year to date total of $544,012. Hegar sent cities, counties, transit systems and special purpose taxing districts $679.9 million in local sales tax allocations for July, nine percent more than in July 2016. “The cities of Houston, San Antonio, Dallas, Austin, Fort Worth, Midland and Odessa saw noticeable increases in sales tax allocations,” Hegar said.